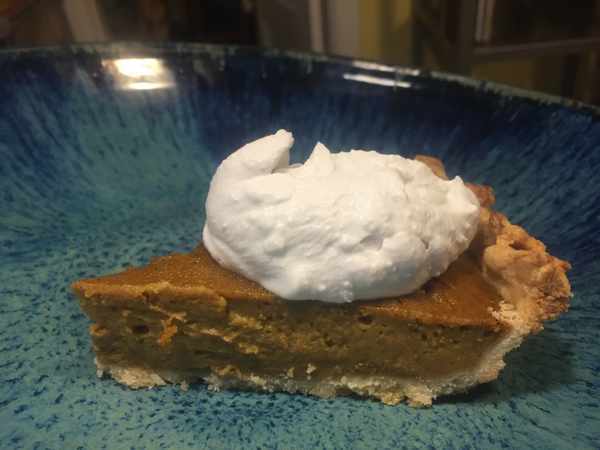 You will love this planet-friendly, vegan pumpkin pie–it tastes as good or better than any traditional version, but without the dairy and eggs. It gets serious richness from cashews, and the flavor is all pumpkin, sweetness, and spices. It was developed by Josh Meckel, Creator of Loving Cooperative and Creative Director of Meals for the Planet, with inspiration from the Gentle Chef. If you have a blender and if you are using prepared crusts, this takes less than 15 minutes of active preparation. The carbon footprint of this pie is less than a third of that of its traditional counterpart. 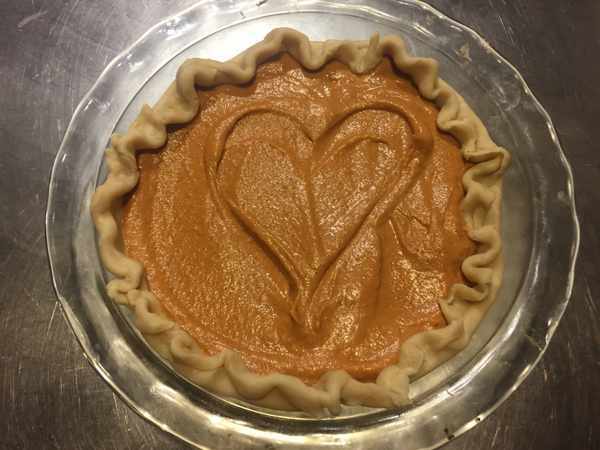 This delicious pie developed by Josh Meckel, Creator of Loving Cooperative and Creative Director of Meals for the Planet, with inspiration from the Gentle Chef. The carbon footprint of this pie is less than a third of that of its traditional counterpart. 2 10 inch vegan pie shells You can purchase or make a vegan crust. Also try graham. 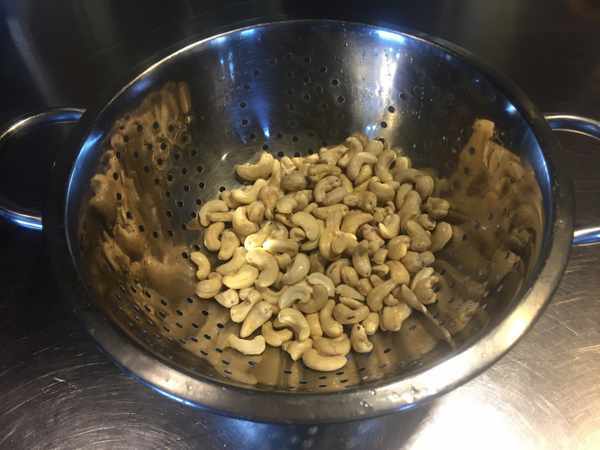 1.25 cup cashews whole raw. You can add a bit extra if you'd like. Soak the cashews in water for several hours or in hot water for an hour. Drain the cashews and blend with non-dairy milk until smooth. Add the remaining ingredients and process until completely smooth. 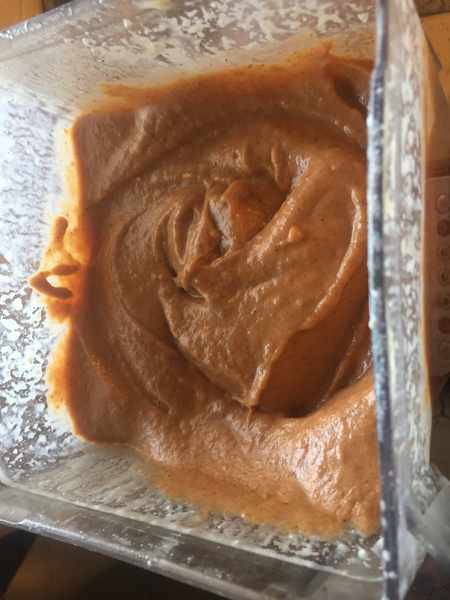 The mixture will be quite thick, so occasionally stop to scrape down the sides of the blender with a spatula and stir the contents back down into the blades as necessary. Pour or spoon into the pie shell. Crimp the crust if not already crimped, Mark with a heart if you'd like, and bake for 15 minutes. 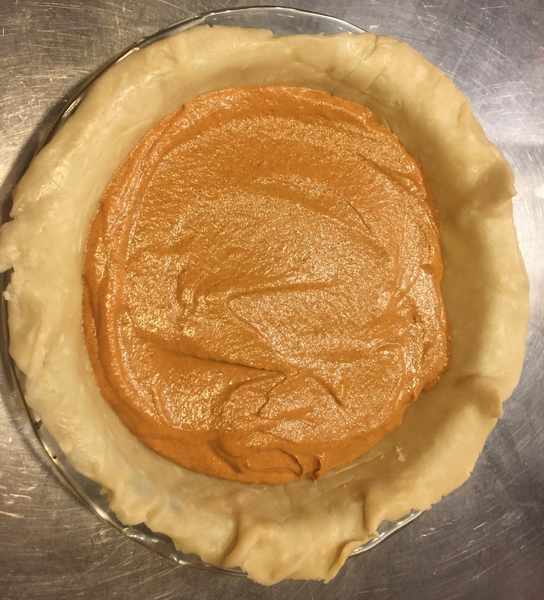 Reduce the heat to 350°F and continue to bake for an additional 55 to 60 minutes or until a toothpick inserted in the center of the pie comes out clean (do not exceed 60 minutes). You can enjoy this alone, or with a coconut cream. You'll need to have stored a can of coconut milk in the fridge to separate the solid and liquid. I always keep a few cans in the fridge for just this purpose. Open it carefully, and scoop the solids into a bowl (you can use the water in a smoothie). Add a bit of maple syrup or sugar and vanilla, and mix with an immersion blender or mixer. 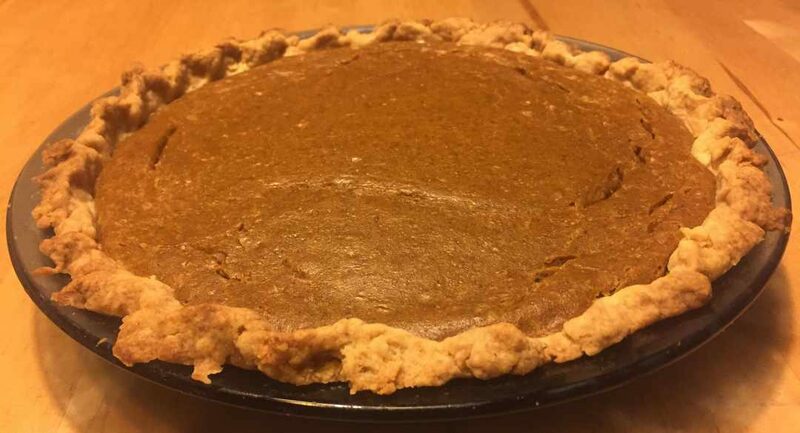 Using a traditional pumpkin pie recipe (using egg and condensed milk) the footprint would be 4,600 g CO2-eq for the pies with a pastry crust and 3,440 g CO2-eq for the graham cracker crust (for non-vegan versions, the pastry crust footprint is significantly higher than the graham cracker crust footprint due to the larger amount of butter). The choice to use this vegan recipe saves about 3,200 CO2-eq, which is about the amount used in a 14-mile drive in a 40 MPG car. We can also think about changes in footprint in terms of the amount of GHG emissions reductions we would need to meet the Paris Climate Accord. To meet the agreement, our country needs to reduce its GHG emissions by 447 million metric tonnes per year relative to today’s levels, by 2020. By dividing by the current US population, we can calculate a per capita target reduction of 3,660 g CO2-eq/day. See the articles Taking Climate into our Own Hands and Low Hanging Fruit for a Low Carbon Life for more information. Choosing to bake this recipe rather than two traditional recipes is equivalent to 87% of the per capita Paris Climate Accord reduction. One slice of this pie has a footprint of 89 g CO2-eq, while a slice of pie from a traditional recipe has approximately 287 g CO2-eq. Thus, choosing a slice of this pie over the other amounts to 5% of the per capita Paris Climate Accord target. 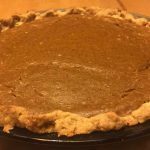 If you prefer using maple syrup over sugar, Minimalist Baker has a great vegan pumpkin pie recipe for you, which would also have a low carbon footprint. I brought this to a Thanksgiving party and everyone loved it. In general, the numbers show that in any recipe you can really lower your carbon footprint by switching out dairy butter for a vegan butter. For example, if you were going to add a quarter cup of butter (which has a footprint of 12 gram CO2-eq per gram) to a bowl of mashed potatoes, using vegan butter (which has a footprint of 1.4 grams CO2-eq per gram) instead saves around 600 g CO2-eq! Conventional butter has a high carbon footprint because the natural metabolism of cows results in production of methane, a potent greenhouse gas. In addition, dairy cows require feed crops, which in turn require fossil fuels for fertilization, production, and transport. Finally, cow manure emits methane and nitrous oxide—both greenhouses gases. For another great holiday dessert, see the recent post for Cherry Pie for the Planet. and Apple Crisp for the Planet. Please join our FB group. Also, you can follow us on instragram: #meals4planet or twitter @meals4planet. Learn more about Josh Meckel at plantpoweredprophet.com and lovingcoop.com. Learn more about the Gentle Chef, Skye Michael at thegentlechef.com. He has a great set of vegan holiday recipes! Nutritional information is from the USDA Food Composition Database.